What is a locksmith exactly? In the simplest terms, they are expert contractors who specialize in all systems of door entry such as doorknobs, locks, keys and other security features. Our locksmiths at Locksmith-4-U have experience with a wide variety of lock systems and specialize in repairing and installing residential locks and keys. Locksmiths-4-U specializes in repairing and installing residential locks. Locksmith-4-U are well equipped to cut all types of keys for almost any residential door lock. For instance, if you have lost your key, our staff can help you by making another key that matches your door lock. If you have only one copy left, additional copies can be made from the existing one all thanks to the help of a Locksmith-4-U locksmith. 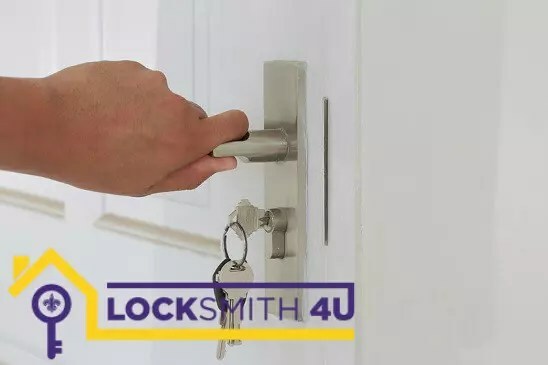 If you have a broken lock in your home, we at Locksmith-4-U can replace it for you. Rekeying is affordable and practical, but sometimes replacement is safer. Our locksmiths are equipped to advise you on whether you need to replace your lock or whether we can mend it. Locksmith-4-U will leave you with the right information to make the decision that suits you best. Have you ever found yourself outside when you realize that your key is locked inside? We know how stressful that can be.This is where a Locksmith-4-U locksmith can come into the picture and save the day. Our experienced locksmiths can either pick your lock or break it, to reunite you with your key. Re keying a lock can be the best solution when the security of your home is at stake. Instead of changing the whole door, a Locksmith-4-U locksmith can simply remove the lock and provide a new setup with all new keys. Our staff have the skills to install a new lock that looks just like it is part of yourdoor. Locksmith-4-U will give you a recommendation on the locks that best suit your door or your windows before you make any purchases.